What is the Average Startup Budget? The Company Warehouse’s research on Startup Funding found that the average budget for new UK startup businesses is £5,000. Our research focussed on early stage startups who had completed a limited company formation or sole trader business registration within the last 18 month. We found that the majority of entrepreneurs we spoke to had relatively modest startup budgets with 51.2% budgeting less than £5,000 to get their business up and running. By contrast, only 28.2% had budgeted over £10,000. Which industry has the most expensive startup budgets? When people hear startups, they often think of disruptive, high-tech businesses, such as those clustered around Silicon Roundabout in London. However, the tech industry only makes up around 6% of the UK economy. The majority of new startups actually come from more traditional sectors such as the construction, retail and healthcare industries. As a company formation agent The Company Warehouse deals with a startups from a wide range of industries and this is represented within our Startup Funding report. There were some clear trends in the level of budget startups from different industries. The startups with the highest budgets were from the finance and recruitment industries where 75% of entrepreneurs we spoke to had budgets over £10,000. The industries with the lowest startup budgets were construction and creative companies. Of the construction businesses we spoke to 100% had budgets under £5,000. 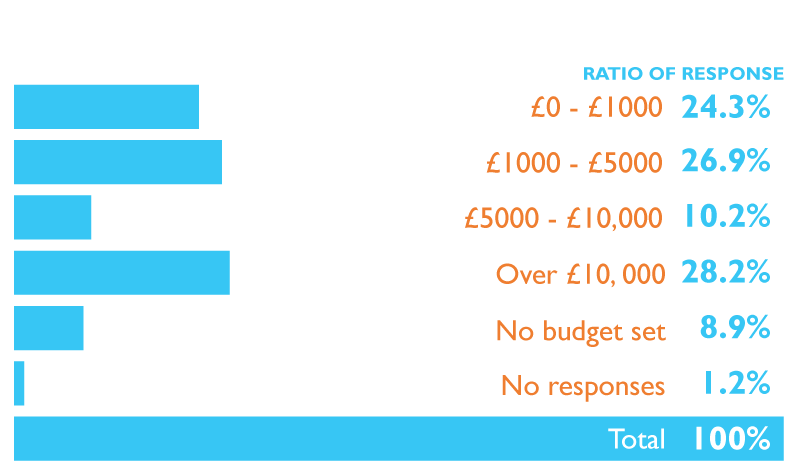 Of the creative businesses, such as designers and photographers, 67% had a startup budget under £1000. This difference in startup budgets is likely to have a relationship to the costs expected. A graphic designer working from home, or a photography enthusiast turning their hobby into a business are likely to have low startup costs. Other than some basic marketing, and perhaps some specialist software they are not going to need to spend huge amounts of money to get their first clients. Similarly a builder, plumber or electrician starting their own business is likely to have already been working in the trade and to have the necessary equipment and contacts to get their business running without spending a huge amount. Conversely new businesses involved in finance or recruitment are likely to need expensive legal services and are also more likely to need to rent office space and to spend more highly on marketing and websites to establish their credibility. In many industries there was more of a spread of budgets but across all industries most startups we spoke to had a budget under £10,000 to get their business up and running. Running out of cash is often cited as a key cause of startup failure so it important for new startups to control their costs and watch their budget closely. At The Company Warehouse, we have been working with startups since 2003. We have seen first-hand how important it is for startups to keep costs as low as possible and have developed a range of services tailored to the needs and budgets of new businesses. As well as UK company formations and business registrations, we provide low-cost accountancy support, affordable search engine optimisation, website design, digital marketing, and free business consultancy.